According to several reports out Tuesday, President Robert Mugabe resigned in a letter submitted to the country's parliament. Zimbabwe's President Robert Mugabe officially stepped down after nearly four decades in power. According to several reports out Tuesday, he resigned in a letter submitted to the country's parliament. 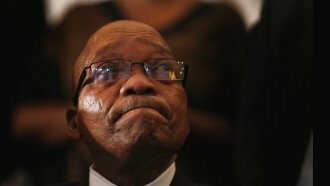 Mugabe's resignation came the same day that his own political party started impeachment proceedings against him. The party ousted Mugabe as president on Sunday and gave him until the next day to step down. He was expected to announce his resignation during a televised speech Sunday night. But instead, he promised to preside over a party congress scheduled for next month. The embattled president has been under house arrest since the country's army moved into the capital last week. Opposition to Mugabe's leadership grew after he fired his vice president, which was seen as an attempt to establish first lady Grace Mugabe as his successor. Thousands of people flooded the streets calling for Mugabe to step down. And crowds outside parliament Tuesday reportedly celebrated his resignation by singing and dancing. Mugabe's former vice president is now expected to take over as the nation's leader.